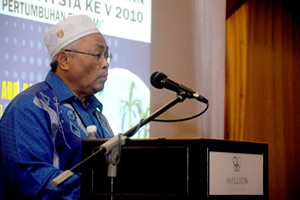 Port Dickson, 18 Oct. 2010 – UKM has progressed to becoming a leading generator of scholarship and as a research university will give emphasis to research and producing knowledge products in varied disciplines. UKM has already identified eight niche multi disciplined areas that form its basic strategy to move foward. This was stated by the Vice Chancellor, Prof Tan Sri Sharifah Hapsah Syed Hasan Shahabuddin when opening the Fifth Malaysian National Economic Conference here last Friday. 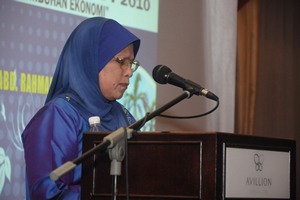 Her speech was read out by the Deputy Dean of the Faculty of Economics and Management, Prof Dr Rahmah Ismail. The niche areas were identified based on their potential to garner the multidiscipline resources available that could form the basis for the nation moving foward through a holistic approach by incorporating education with research and community service. UKM thus needed to be ahead in all fields of knowledge to propel itself as a leader through examplary working papers and conferences while providing enough support to enable its staff to organise and participate in the various seminars and conferences. Thus conferences where academic discourses can be carried out are encouraged so that there will be interactions between researchers, policy makers and other related personel to produce papers and publications as the output from the conferences. 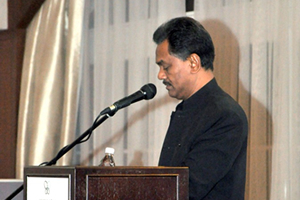 The conference was opened by Deputy Secretaqry General of the Ministry of Higher Education, Dato’ Omar Abdul Rahman. Present was Chairman of the Seminar Committee Prof Madya Dr Md Zyadi Md Tahir. A total of 80 working papers were presented that looked deeply the at the state of the Malaysian economy. It was attended by about 100 participants . The conference hoped to be the platform for new researchers to equip them to meet challenges of becoming academicians of substance. Prof Sharifah Hapsah said the university will continue to support activities aimed at improving and enhancing knowledge and scholarship of its academic staff.